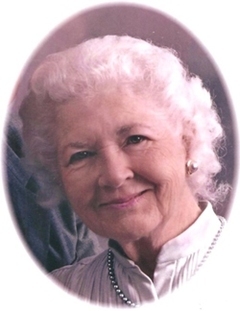 Obituary – Campbell, Mary Lou (Queen) « Perry High School Alumni Association, Inc.
﻿- is the daughter of Mr. and Mrs. H. W. Queen, 1301 Cedar street. She is one of the grads who is really interested in art. Her sports hobby is “just any good game.” She plans to take an accounting course following graduation. She was born in Perry and attended school here all her life except for one year spent in Oklahoma City schools. She was a member of the Red Hots. Mary Lou Campbell passed away on July 1, 2012, at age 91. She was the third of 8 children born to Howard W. and Mary Julia Doyle Queen in Perry, Oklahoma. She was the first in her family to attend college, graduating from Oklahoma A & M (now OSU) in 1943 with a degree in business. While at school she met her future husband, John Campbell, at a St. Patrick’s Day dance. After graduation, he completed basic training with the United States Marine Corps and then they were married in the chapel at Quantico, Virginia, on September 11, 1943. Their daughter Anne was born the next year and their son John two years later. After the war ended, the young couple made their home in Tulsa, where they lived the rest of their lives. Mary was an active mother, serving as a Camp Fire Girl leader from Blue Birds through high school and as a den mother in Boy Scouts. 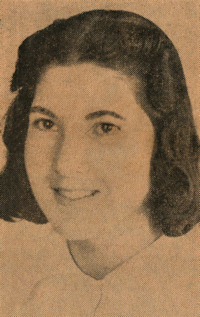 She served as a coach for girls’ softball and volleyball league teams. Mary’s true passions were gardening and cooking. She continued working actively in her garden as long as her health permitted and had a true green thumb. In the kitchen, she exhibited the artistic abilities she shared with several of her professional artist siblings, producing everything from ornate gingerbread houses (first prize at the Tulsa State Fair) to delicately decorated chocolate candies. Her skills were also displayed in a variety of handcrafts including hand-painted porcelain nativity scenes and flower arrangements. She was a superb bridge player and devoured reading material, from the daily newspaper to novels. Mary was preceded in death by her parents and 5 of her brothers (Howard Jr., George, Patrick, Hugh, and John). She is survived by a daughter, M. Anne Spence of San Luis Obispo, CA, and a son John (wife Jeanne) Campbell of Caney, KS; a granddaughter Elizabeth (husband Chris) Campbell, and their daughter Violet and son Daschel of Prairie Village, KS; a grandson Waite Campbell of Great Bend, KS; brother Jim Queen of Coolspring, TX; and a sister Patt (husband Jerry) Emanuel of Claremore, OK; numerous nieces and nephews and their children. Mary’s husband of 68 years, John P. “Jack” Campbell died this spring. In lieu of flowers, a memorial has been established in their names at the Tulsa Air and Space Museum. Donations in their memory will be used to enhance the program for children. The family is indebted to Dr. Barbara A. Baker whose skills provided so many good years in spite of complicated medical issues. The family would like to thank the kind and caring staff of University Village and the wonderful staff at St. Francis Hospice and Senior Select Services. Services will be a graveside at 11:00 am, Friday, July 6, 2012 at Memorial Park Cemetery.